Разстояние до летището 19,5 км. Имате въпрос към Wok & The Much Rooms Hostel? При посещение в Ко Панган, в Wok & The Much Rooms Hostel ще се почувствате като у дома си, защото предлага квалитетно настаняване и отлично обслужване. Центърът на града е на около 1 km, а до летището може да се стигне до минути. С удобното си местоположение хотелът предлага лесен достъп до всички градски забележителности, които задължително трябва да се видят. Съоръженията и услугите предлагани в Wok & The Much Rooms Hostel гарантират Вашия приятен престой. Този хотел предлага множество удобства, за да задоволи и най-изискания вкус. Дизайнът на хотела е съобразен с най-високите изисквания за удобство и комфорт, осигурявани от съоръжения достъпни в някои стаи като безжичен интернет достъп (безплатен), стаи за непушачи, климатик, сейф в стаята, душ. Освен това в хотела можете да се възползвате от множество предложения за приятно прекарване на свободното време. Когато търсите удобно и комфортно място за настаняване в Ко Панган, изберете Wok & The Much Rooms Hostel, който ще се превърне във втория Ви дом. Владельцы отеля-китайцы-отличные ребята и хорошо говорят по-русски. Хостел удобно расположен. Все рядом. Если нужно просто ночевать-отличный вариант. Had a great time here! The staff are super helpful and want to see you have a great time on the island. Would stay here again. It's a 34 bed dom and is good for solo traveller as you get to meet a lot of people travelling. No hot shower though. Cheap clusterfucked bunks, no privacy, fun for parties when you're trying to have a good time. 100 baht on shared taxi to most parties and the full moon festival, but about 10-15 walk from the pier where the ferries arrive. Awesome group of people staying here except make sure you lock your things up in the small lockers because there are no locks at all on the main door. A couple people were robbed of small things. Better than Backpackers hostel looked. One weird thing they kept doing was turning off the the AC, to save money I assume but it was hot as sweaty balls. Not good for a hangover. The room was dark though which was nice. Definitely a party dorm, so have a good time because you won't be spending much time in the hostel anyway. The hosts were nice when they were around but they seemed busy and we never really saw them even when we wanted something, but with that many people it doesn't surprise me. It was wonderful. The hostel is located near the pier in a walking distance with 7-11 nearby and the local bus passing the hostel. The owner and staffs are very nice and helpful. 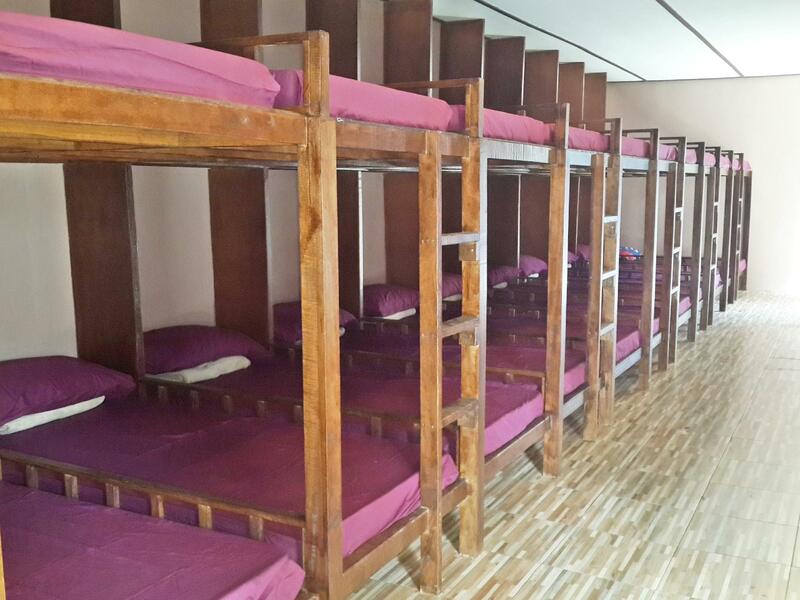 The dorm has every most of the basic need you would want, but no towel, shampoo and s provided. The room was dorm, simple small bed. The room is a little darker but cleanliness! and most important point is owner and staff are very kind, helpful!! I was satisfied to stay there. It was conveniently located close to shops, restaurants, main pier, food market. Absolutely I recommend this place!! It was fantastic. The owner speaks mandarin (Beijing accent) and he was very accommodating towards me. My flight was delayed an hour and I took the latest ferry (7.30pm) from Donsak and reached at 11pm+, he still greeted me with a smile. When I left, he has already prepared the deposit I paid and I didn't need to wait for anything. His parents are so gentle and kind as well, I feel embarrassed to wake them up so late. Plus, this hostel accepts one night's stay during the full moon party period, another +5!! Very rare. Totally would stay there again. Walkable to Thong Sala Pier. Easy to find food. located near the night market and with lots of restaurants and scooter rentals around the hostel ist located very well even if you dont only want to join the full moon party (taxi to haad rin about 100 thb, ca. 20 min) when i was ill one day there, the hosts took care about me, very kind. the mattrasses where very hard but not uncomfortable. i liked my stay there very much and can really recommend it. Too many beds next to each other. It was kind of horrible. People put up with it only because other accommodations are way too expensive. Max the owner goes out of his way to make sure his guest enjoy their stay, the rooms were cool, clean, so we're the bathrooms, and the food is without question the best I've had in town. As much as one could expect for such a cheap stay. Food was brilliant despite being of low cost. Too much! They charged me a fine because my friend came into my room for 3 hours..